It is a truth universally acknowledged that a new baby in possession of crafty neighbours must be in want of handknits. Our closest neighbours just had a baby daughter. I really wanted to make something for her. I very loosely adapted an existing pattern, that I turned into something more elaborate and girly. Just so you can see the difference from the initial pattern, here’s a jacket made faithfully from the pattern. Since my sister has 2 boys (Robin, 4, and Florian, almost 1), I haven’t had much opportunity to have fun with girly baby stuff. I didn’t want to make something overly frilly, but I thought simple shells and scalloped sleeves would be nice. 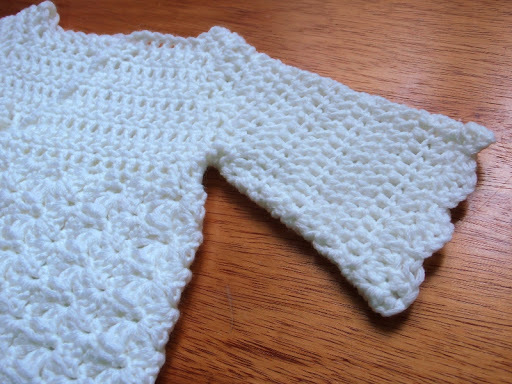 – I kept the initial raglan-sleeved yoke in double crochet. 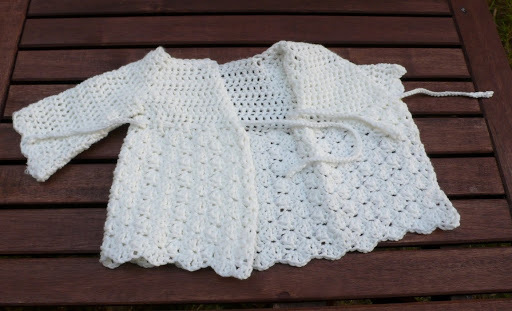 – Body: I crocheted in double crochet until the jacket reached the same length as the portion above the ties in my sister’s RTW jacket; I then started crocheting in staggered shells. I forgot to take notes while making it and am currently too brain-dead to reconstruct the whole process, but if someone wants me to guide them through it, let me know and I’ll write everything down whenever my brain gets the rest it needs to function properly. The shells themselves are (2DC, ch1, 2DC), alternated with single crochet stitches. – Ties: I guess the following two pictures are pretty self-explanatory. This last picture shows how I threaded the chain tie through the last rows of DCs. I made the chain ties with a smaller hook than the jacket (3 mm instead of 5mm). 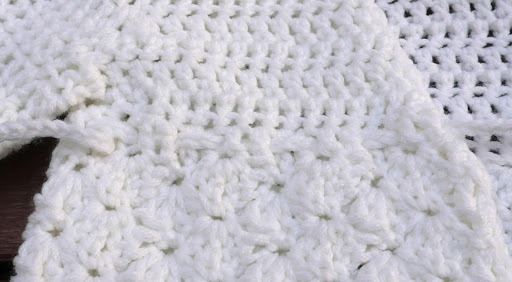 The yarn is Lang Omega, a plump yarn that yields a sturdy and washable result. 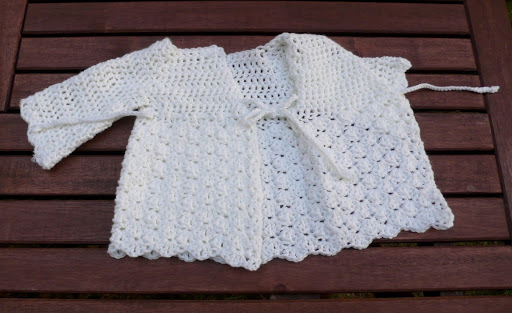 Lang Yarns are fabulous – I’ve always been very happy with them. 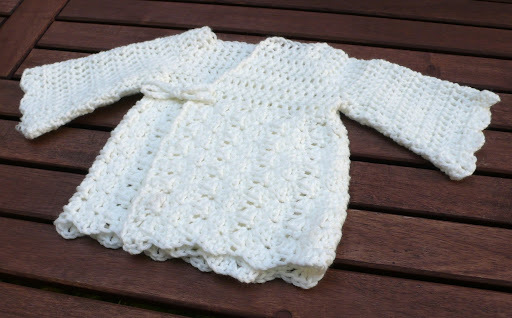 Beautiful jacket for Baby Mila…you dida wonderful job on it! Beautiful jacket, you did incredible work. So sweet, and generous of you to make it since you are one busy lady. C'est superbe. Justement, je regrettais que Phildar (pour ne pas le nommer) ne faisait pas ce genre de patron. Je pensais tricot, mais c'est vrai qu'au crochet, ca rend super bien aussi. Bravo Isabelle, c'est très joli cette petite layette. C'est un beau cadeau pour une petite fille toute neuve 🙂 J'aime son côté un peu vintage! Beautiful! And how right for a baby girl. Just sweetness. It's beautiful! Her parents must just love it. What a beautiful gift Isabelle. Mila's mum must be so thrilled that you made this for her. As for Mila – what a lucky little girl to be wearing something so special. Et d'abord, j'adore ton clin d'oeil à cette dear Jane en ouverture !! Gros bisous ma chère amie, passe un bon week-end ! Gorgeous! I'm sure your neighbor will be touched and will treasure your gift! quel beau petit gilet! c'est adorable! This is such a wonderful jacket! Baby Mila and her parents will definitely be very happy about it. Great work!